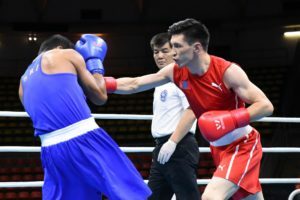 The Mongolian National Boxing Championships started in their capital city in Ulaanbaatar which is a selection competition for the 2019 international events. Thirteen champions will be crowned in the Mongolian National Boxing Championships after the sixth competition day. It is already sure that ASBC Asian Confederation Boxing Championships silver medallist Gan-Erdene Gankhuyag won’t be there among the winners following his surprise loss on Day1. The women boxers can fight in five weight classes in the Mongolian National Boxing Championships: flyweight (51kg), featherweight (57kg), lightweight (60kg), welterweight (69kg) and middleweight (75kg). The men boxers are attending in the event in the new eight categories as follows: 52kg, 57kg, 63kg, 69kg, 75kg, 81kg, 91kg and +91kg. Altogether a total of 168 athletes including 50 women and 118 men boxers are attending in the Mongolian National Boxing Championships. Mongolia’s young women prospects as Jargalan Ochirbat, Lutsaikhan Altantsetseg, AIBA Women’s Youth World Boxing Championships bronze medallist Namuun Monkhor and Erdenedalai Michidmaa are also attending in the national event in Ulaanbaatar. Erdenebat Tsendbaatar won the gold medal at the lightweight (60kg) in the Jakarta 2018 Asian Games and his top teammate Rio 2016 Olympian Chinzorig Baatarsukh achieved silver in the Indonesian capital this August. The two Mongolian stars are now attending at the 63kg weight class and could be meet in the final of the National Championships. Mongolia’s veteran boxers such as London 2012 Olympic Games bronze medallist Uranchimeg Munkh-Erdene, Narmandakh Shinebayar, Chuluuntumur Tumurkhuyag, Khishigbaatar Mandakhbayar, Tolek Yerbolat and Daivii Otgonbayar all returned to take part in the National Boxing Championships. Mongolia’s ASBC Asian Confederation Boxing Championships silver medallist and Rio 2016 Olympian Gan-Erdene Gankhuyag moved up to the flyweight (52kg) which is the most popular where 27 boxers are attending for the medals. Mongolia’s most experienced athlete in this weight class surprisingly lost his first bout in the preliminary stage following his bout against a relatively unknown boxer 19-year-old N. Enkhtur who caused the biggest surprise of the first competition day in Ulaanbaatar.